A worker was erecting a formwork for drainage on a approximately 2.5 m deep excavation when it suddenly collapsed trapping him in between the formwork and ply-board used as a temporary wall to support the excavation. Before it happens, a prop was used to support the ply-board but somebody removed it in order to give way to the formwork that was to be erected. Prior to this incident, it was observed that a JCB excavator was seen delivering materials near the excavated area. Hence, this is the possible cause of the incident that it might have disturbed the integrity of the excavation. Fortunately, the injured person sustained minor injuries, because he was trap only up to the knee level. 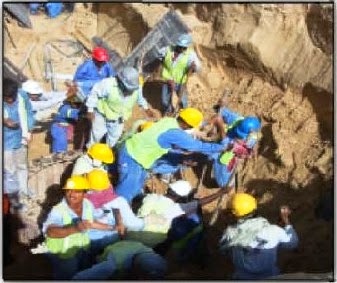 The protection of the excavation is UNSAFE or inadequate shoring. 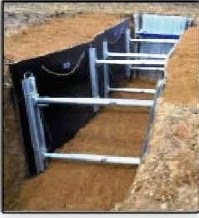 If excavation is too deep, use shoring method to support the sides of excavation with vertical, horizontal and cross braces to prevent cave-ins and collapse. 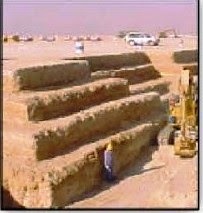 Benching method involves cutting the sides of the excavation to form one or more horizontal levels or steps with vertical surfaces between levels. 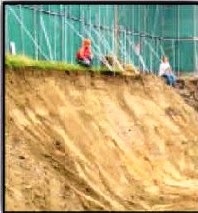 If an excavation is less than 4 m deep, sloping the sides of excavation is a good option. Slope angles should be determined by the soil type.